Although still a relatively young technology, social networking is already a global phenomenon. In regions around the world — and in countries with varying levels of economic development — people who use the internet are using it for social networking. And this is particularly true of young people. Meanwhile, other forms of technology are also increasingly popular across the globe. Cell phone ownership and computer usage have grown significantly over the last three years, and they have risen dramatically since 2002. While social networking has spread globally, it is particularly widespread in the country where it began. Among the 22 publics surveyed, Americans most often say they use websites like Facebook and MySpace: 46% use such sites, 36% use the internet, but do not access these sites, and 18% say they never go online. Germans and the Japanese stand out among highly connected publics for their comparatively low levels of participation in social networking. While 31% of Germans use these types of sites, 49% go online at least occasionally but choose not to use them. In Japan, 24% are engaged in social networking, while 44% have internet access but are not engaged. 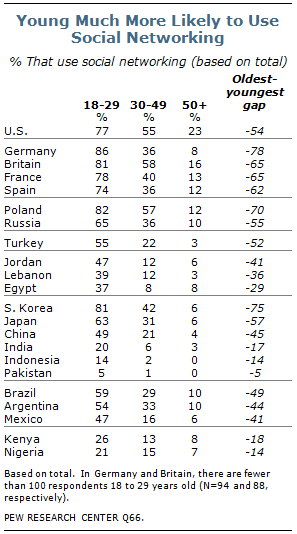 The survey by the Pew Research Center’s Global Attitudes Project, conducted April 7 to May 8, also finds that, while involvement in social networking is relatively low in many less economically developed nations, this is largely due to the fact that many in those countries do not go online at all, rather than disinterest in social networking in particular. When people use the internet in middle and low income countries, they tend to participate in social networking. For example, in both Russia and Brazil, most respondents do not go online; among those who do use the internet, however, social networking is very popular. In both nations, 33% say they use social networking sites, while only 10% have internet access but are not involved in social networking. The same general pattern holds true in the two African nations surveyed — in Kenya and Nigeria, when people have the opportunity to go online, they tend to use social networking sites. Roughly one-in-five Kenyans (19%) participate in social networking, while just 5% use the internet but do not participate. Similarly, 17% of Nigerians go to these sites, while only 7% go online but do not access such sites. Among the 22 countries polled, social networking is least prevalent in Indonesia (6%) and Pakistan (3%). In both nations, more than 90% of the population does not use the internet. In every nation surveyed, there is a notable age gap on this issue. Social networking is especially popular among people younger than age 30 — in 12 of the countries polled, a majority of this age group uses these types of sites. There are only three countries — Britain, Poland and the U.S. — in which most 30 to 49 year-olds are involved in social networking. And there is no country in which even one-quarter of those ages 50 and older are involved. In 10 countries, a gap of at least 50 percentage points separates the percentage of 18 to 29 year-olds who use social networking sites and the percentage of those ages 50 and older who do so. The age gap is perhaps most striking in Germany, where 86% of people younger than age 30 take part in social networking, compared with 36% of 30 to 49 year-olds and just 8% of those ages 50 and older. While it is true that the young are more likely to go online, these age gaps are not driven solely by internet usage. Even among internet users, young people are more likely to participate in social networking. There are relatively few gender gaps across the countries surveyed. For the most part, men and women tend to engage in social networking at roughly the same rates. However, there are a few exceptions, including Turkey, where about one-third of men (34%) use social networking, compared with only 19% of women. Similarly, in Japan, 30% of men report that they are involved in social networking, while just 19% of women say the same. The U.S. is the only country in which women are significantly more likely than men to use social networking. While 52% of American women engage in social networking, just 41% of men do so. This gap is not driven by a difference in access — similar percentages of women (18%) and men (17%) say they do not access the internet. More people around the world are using computers and cell phones than was the case just three years ago, and the increase is especially dramatic compared with 2002. Internet usage has also become more widespread in recent years, and more now say they send or receive email at least occasionally. Looking across the 16 countries for which trends are available, the median percentage of people who own a cell phone has increased by 36 percentage points since 2002. The current median is 81%, compared with 45% earlier in the decade. In 2007, the median percentage owning cell phones across these 16 countries was 70%. The increase in cell phone ownership has been especially dramatic in Russia. About eight-in-ten Russians (82%) now say they own a cell phone, compared with just 8% in 2002. 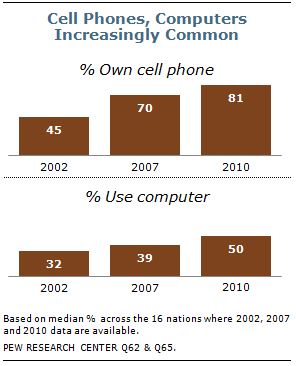 In 2007, about two-thirds (65%) had a cell phone. 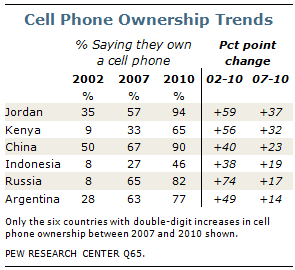 In Kenya, cell phone ownership has increased sevenfold, from 9% in 2002 to 65% in 2010, and far more also own cell phones in Jordan (up by 59 percentage points), Argentina (49 points), China (40 points) and Indonesia (38 points) than did so in 2002. Computer usage has also increased considerably, although at a slower pace than cell phone ownership. Currently, across the 16 countries where trends are available the median percentage of computer users is 50%; in 2007, the median was 39% and, in 2002, a median of 32% said they used a computer at least occasionally. In Russia, where just about one-in-five (19%) said they used a computer at least occasionally in 2002 and 36% said that was the case in 2007, nearly half (47%) now use a computer. Four other countries have also seen a double-digit increase in computer usage compared with just three years ago. That is the case in Argentina (from 35% in 2007 to 50% in 2010), Turkey (from 29% to 42%), China (from 40% to 50%), and Kenya (from 12% to 22%). As people have gained more access to computers and cell phones, internet and email usage have also increased. A median of 45% across the 18 countries for which 2007 trends are available now say they use the internet at least occasionally; three years ago, when the Pew Global Attitudes Project first asked this question, a median of 35% said that was the case. The median percentage that sends or receives email at least occasionally has also risen, although not as steeply, from 29% in 2007 to 34% in 2010. As is the case with cell phone ownership and computer usage, internet usage has become especially more widespread in Russia. More than four-in-ten Russians (44%) now say they use the internet at least occasionally, compared with just a quarter in 2007. In three of the four Western European countries surveyed — Spain, Britain and Germany — where a majority already said they used the internet three years ago, the percentage saying that is the case has increased by double digits. For example, about two-thirds (68%) in Spain now say they use the internet; a much narrower majority (54%) said that was the case in 2007. In six of the 18 countries for which trends are available, the percentage saying they send or receive email at least occasionally has increased by 10 percentage points or more since 2007. In Poland, about half (51%) now say they use email, compared with just about a third (34%) three years ago, and, in Russia, twice as many say they communicate via email as said so in 2007 (33% vs. 16%). Double-digit shifts are also evident in Spain (up 13 percentage points), Argentina (13 points), Britain (10 points) and Turkey (10 points). While access to computers, cell phones, the internet and email has become more widespread across much of the world, fewer in Lebanon now say they use this type of technology than did so in 2007. The declines in reported computer and email usage among Lebanese respondents are especially notable. Just over half (52%) now say they use computers, compared with 61% in 2007; and while just about a third (35%) say they send or receive email at least occasionally, 56% said that was the case three years ago. Across the world, the adoption of these technologies is consistently more common among the young and the well-educated. Specifically, people younger than age 30 and those with a college education are especially likely to say they use the internet and own a cell phone. Significant differences across age and educational groups also characterize computer and email usage. For example, while nine-in-ten Poles ages 18 to 29 utilize the internet at least occasionally, only a quarter of those ages 50 and older say the same. In China, more than eight-in-ten (83%) of those ages 18 to 29 say they use the internet, compared with only 16% of those ages 50 and older. The same pattern holds for cell phone ownership. For instance, nearly all Poles younger than age 50 own a cell phone (96% of those ages 18 to 29 and 94% of those ages 30 to 49), but only a slim majority (53%) of those ages 50 and older say they have a mobile phone. Similar gaps of more than 30 percentage points between the young and old appear in Lebanon, Mexico, Brazil, India and Indonesia. Age gaps in internet usage and cell phone ownership exist in nearly all of the 22 countries polled, regardless of a country’s level of economic development or technological advancement. The education gap in internet usage and cell phone ownership is just as striking. In Jordan, nearly nine-in-ten (88%) of those who have attended college use the internet, while only one-in-five of those who did not attend college say the same. Education gaps of more than 50 percentage points are also found in Egypt, Kenya, Brazil, Turkey and Mexico. Similarly, the college educated are consistently more likely than those with less education to say they own a cell phone. This is especially true in Pakistan, where 77% of people with at least some college education have a cell phone, compared with 35% of those without a college education. In Mexico, 86% of those who have attended college own a cell phone, while just 45% of those who have not attended college own one. There are limited gender differences in use of technology such as computers, cell phones, and the internet. For instance, double-digit gaps in internet usage exist in only six of the 22 nations surveyed, with men consistently more likely than women to say they use the internet. About seven-in-ten (72%) Japanese men use the internet, but only 57% of women say the same. And in India, while overall internet usage is low, men are twice as likely as women to say they use the internet (22% vs. 11%). Double-digit differences also appear in Turkey, Germany, Nigeria and Kenya. However, in most of the countries surveyed, there are no substantial gender differences in internet usage. This holds true in countries with high technology usage, such as the United States and France, as well as in countries with less internet usage, such as China and Jordan. There are also limited gender differences in cell phone ownership. In all, double-digit gender gaps for cell phone ownership exist in only five of the 22 nations polled. The largest gap is in Pakistan, where a majority of men (52%) own a cell phone, compared with about a quarter of women (23%). View the full report (PDF) for the topline findings and survey methodology at pewglobal.org. 1. Respondents in each country were given examples of popular social networking sites in their country; see p.26 in the full report (PDF) for details.